Stock up on custom made sisal rope when you shop with Rope Services Direct, the best place to order bespoke rope of all varieties. Sisal is one of the materials we use for natural fibre ropes, with impressive properties making it a worth option for various uses. Naturally sourced, strong and exceptionally durable, our sisal rope is a highly versatile option for anyone who wants a reliable, resistant fibre in their corner. We sell sisal rope to order, so whatever application you have in mind, we can produce twine and cords as well as rope to suit it. At the top of the list of advantages that rope made from sisal offers is an innate resistance to salt water. This means that it can be used in marine environments without succumbing to corrosion nearly as quickly as cotton rope for example. The fibre used to form sisal rope is sourced from agave plants, with a number of other important properties offered as a result. These ropes are sturdy, strong and quite flexible, meaning they can stretch to accommodate heavier loads without snapping. Sisal rope stands out from other natural fibre ropes by offering the ability to remain stable and strong in the face of exposure to salt water. It will not disintegrate or warp as soon as the first wave splashes down. It will hold fast when handling loads to boost safety in a number of environments, not just in maritime applications. The strength of sisal rope comes at the price of flexibility, since it will be a little harder to wind tightly than an equivalent cotton rope. However, this is a small price to pay when you consider its perks. It may seem a little rough and ready, but sisal brings a rustic charm to the table which makes it attractive from a design perspective. This goes hand in hand with its environmentally friendliness, which is assured thanks to its natural fibre construction. While nylon ropes and cords will not break down for centuries, sisal rope is biodegradable for added peace of mind. While you might pick our nylon ropes because of the superior strength and resilience they offer, sisal cord & rope is preferred in cases when the look and feel is more important than these practical qualities. It is easy on the eye and can evoke a classic outdoors aesthetic. Just make sure you consider rope safety if used in fall arrest scenarios. Looking for Sisal Rope Advice? You can find out more about the sisal products we sell, as well as our natural fibre ropes, wire ropes and other offerings, by contacting our team.Sisal rope is commonly available with diameters from 6mm up to 40mm. Give us a ring on 01384 78004 or compose an email using our site to ask your questions about sisal rope. 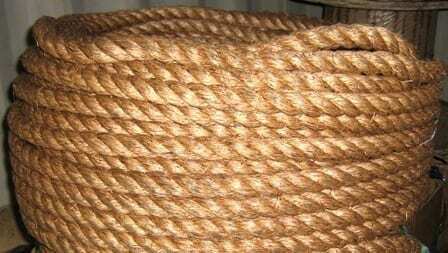 Sisal Rope Overall rating: 5 out of 5 based on 6 reviews.